Sage 50 Manufacturing is ideal for small businesses with a small manufacturing arm or businesses that deal with one off batch production. Sage 50 Manufacturing integrates fully with Sage 50 Accounts which eliminates duplication of work to make your processes more efficient. Sage 50 Manufacturing manages your entire manufacturing process from end to end and automates your Bill of Materials through Materials Requirements Planning (MRP) to ensure your business processes are compliant. 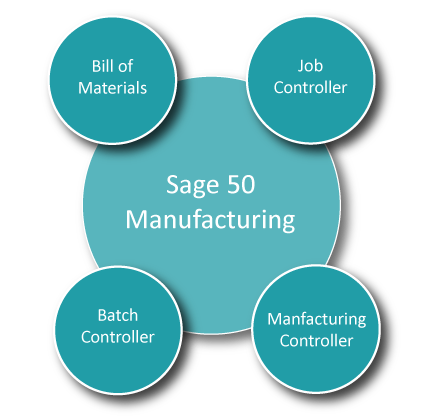 Sage 50 Manufacturing is built up from four manufacturing modules – bill of materials, job controller, batch controller and manufacturing controller. Choose from any of these module depending on which best suits your business processes. Micross Logic are an award winning Sage Platinum partner that are accredited and experienced specialists in Sage 50 Manufacturing. Micross Logic’s expert consultants will guide you through the purchase and implementation of Sage 50 Manufacturing and then provide ongoing support, enabling you to focus more on growing your business. Follow your manufacturing process from end to end. Sage 50 Bill of Materials breaks down your manufacturing operations into simple, easy to access areas, including materials, labour, machines, operations and reports. Access your critical business information to control costs and maintain efficiency and encourage your business to work at maximum productivity and efficiency. Sage 50 Job Controller provides you with a powerful estimating tool to get accurate and timely quotations for your work. Allocate stock and issue it against jobs, which instantly updates your Sage 50 Accounts software, saving you time and reducing manual errors. Sage 50 Job Controller helps you to keep control of costs by enabling you to see your actual costs against your estimates and monitor the profitability for each job. Sage 50 Batch controller gives Production Managers the tools they need to control materials, labour and machine costs in a busy manufacturing environment. Control production, works order processing and manage resources with full batch traceability for materials tracking. Sage 50 Batch Controller is a powerful system that integrates with Sage 50 Accounts to give you greater control of your production control, management functions and your business. Combine the capabilities of Batch Controller and Job Controller into one powerful product. Sage 50 Manufacturing Controller provides you with all the functionality you need to control material, labour and machine costs in a demanding mixed-mode environment. Control production planning, works order processing and resource management smoothly with full traceability for materials tracking.